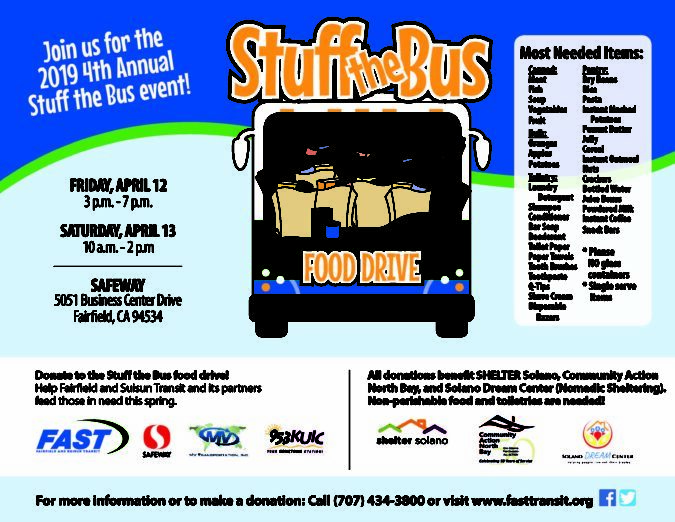 with Fairfield & Suisun Transit today! Fairfield and Suisun Transit (FAST) provides general public fixed route service through eight local and two intercity/commuter routes. Local routes consist of eight routes, serving the cities of Fairfield and Suisun City. Local routes operate from 6:00 a.m. to 8:30 p.m. Monday through Friday, and from 9:00 a.m. to 6:30 p.m. on Saturday. Local routes are managed and operated by the City of Fairfield. The SolanoExpress intercity/commuter routes consist of the Blue and the Green Express (GX) Lines. The Blue Line operates Monday through Saturday, and the Green Express (GX) Line is specifically a commuter route which operates Monday through Friday only. The Blue Line operates between Pleasant Hill BART and Sacramento, and the Green Line operates between Suisun City/Fairfield and El Cerrito del Norte BART. The Blue and Green Express (GX) Lines are managed by the Solano Transportation Authority and operated by the City of Fairfield. All FAST buses are wheelchair accessible and most are equipped with bike racks. FAST buses do not run on Sunday.